A novel safety switch which if accidentally knocked will not change state. It can be used with any three position switch, and requires that a sequence be completed that includes change in direction of the physical switch within a given time period to activate/deactivate the desired function. These switches are ideal for complex IC models with retracts and ignition systems where accidental activation could cause injury or damage to the model. They can also be used as throttle kills on electric fixed wing and rotary craft. Each switch is configured by default to require the activation/deactivation sequence to be completed within 5 seconds. 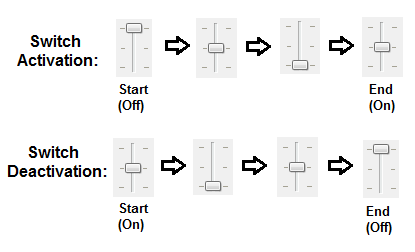 If the sequence is not completed within the time it deactivates and the switch must be returned to its original starting position before another attempt can be made. I have chosen 5 seconds as this makes testing in OpenTX Companion easier, but I recommend shortening the time period to somewhere between 1 and 2 seconds when used on the real model to make accidental activation even less likely. To achieve this alter the “Duration” parameter against the relevant logical switches (L1 & L2, L8 & L9, L15 & L16) to the desired time period in seconds. Activated by physical switch SG (sequence must complete within 5s). Defined by logical switches L1-L6. To be switchable in only one flight mode, replace !SE- in L3 and L5 with FMx (where x is your desired flight mode number). Activated by physical switch SD (sequence must complete within 5s). Switch active only in Takeoff (FM0) and Landing (FM2) flight modes. To be switchable in only one flight mode, replace !SE- in L10 and L12 with FMx (where x is your desired flight mode number). Activated by physical switch SB (sequence must complete within 5s). Defined by logical switches L15-L19. Switch active in ALL flight modes. For description of how to make active in a single/subset of flight modes, see switches 1 & 2. All functions of state are confirmed verbally when activated, and the sound files are attached with the ZIP file – simply paste them into the Sounds folder on your Taranis. I hope you find these useful! Pre-flight checks / Disclaimer- Although these switches have been tested, it’s up to you the pilot to make sure you understand and use them correctly in your model. I cannot be held responsible for any bugs in the setup or documentation, so please remember to test your setup thoroughly before flying!